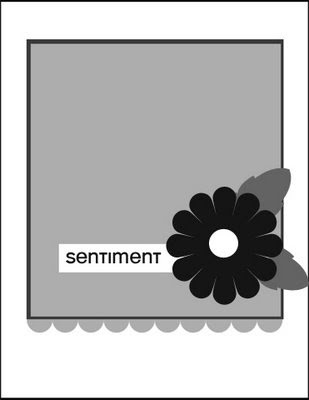 Is it bad to be designing cards with stamps you haven't yet received? It's a habit that's hard to break! Sometimes it even prevents me from using what I already have. However, I think in this case it turned out as a positive thing, once I received the the stamps anyway. It started a few weeks back... April 14th to be exact. It was my stamp club night and I got to see the texture backgrounds for the Big Shot. 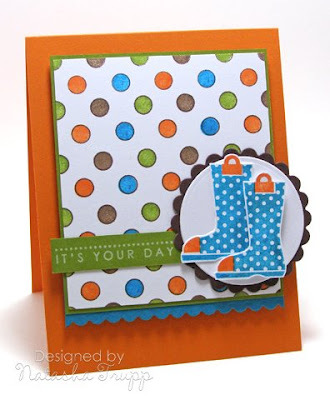 I was inspired to pull out my Fiskars texture plates once I got home. I have no clue if they are the same thickness, I'm guessing they're close. I found that the cuttlebug sandwich: A, Plate, Paper, Silicon, C worked nicely. 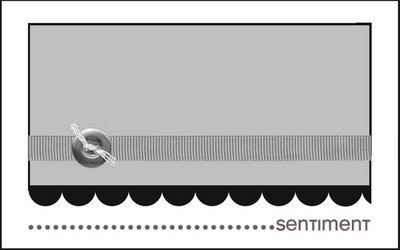 *disclaimer- not all machines have the same tensions, what works in mine might not work in yours, experiment carefully! I went through the the plates and found this cute rain drop one. That was the same night as the Papertrey Ink release party. 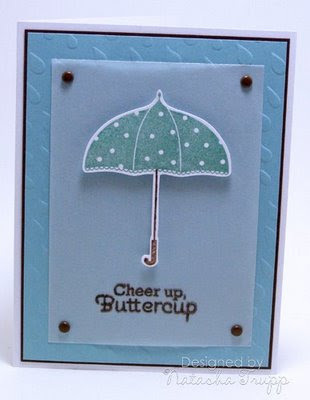 I knew I had to try this particular embossed background with the Scattered Showers set. So for almost 2 weeks I've had this piece of Ocean Tides cardstock embossed and ready to go. So when my stamps arrived today I had to make this card. I originally designed the sketch to be 6x3.75, but feel free to do whatever dimensions you like! 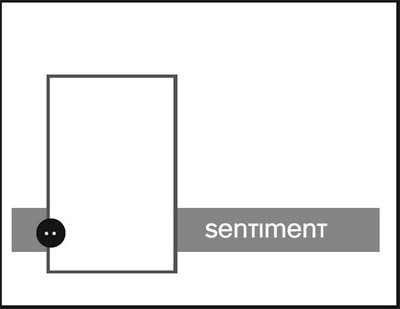 As always, leave a link if you decide to play along. I really love seeing what everyone does with the sketch!!! Here's my take on the sketch. 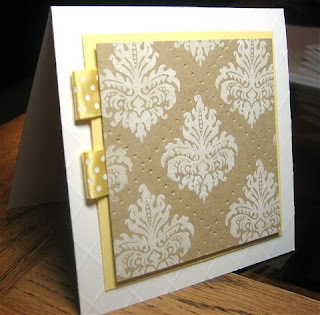 I decided to make some stamped background paper with Damask Designs. 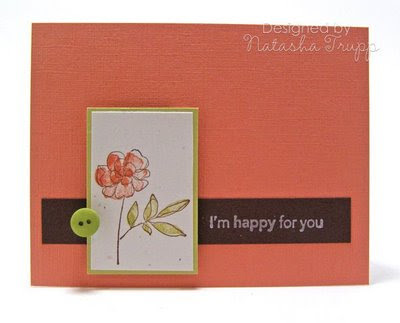 I stamped Vintage Cream on Melon Berry. I'm pretty obsessed with how Melon, Chocolate, and Vanilla look together (sounds like I'm describing a dessert). I threw in a button bow, since I'm loving those too lately. 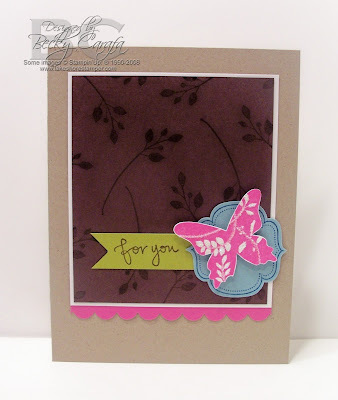 I've been meaning to make my own stamped patterned paper for a while. When I picked up this Detours stamp set, I knew the flowers and leaves would work quite nicely for exactly that. First I needed a bit of inspiration for colour selection. 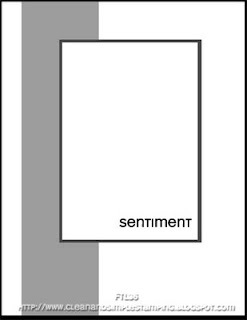 Since these are October Afternoon stamps, I checked out papers from the coordinating line. I found one I liked, then decided on six colours- Kiwi Kiss, Regal Rose, Real Red, Cool Caribbean, Dark Chocolate, and Orangerie, that matched best. Next I just started stamping. 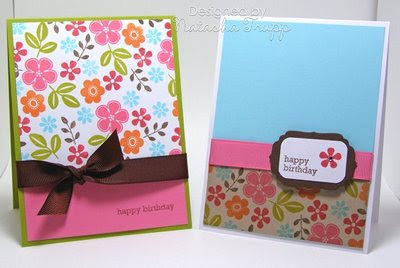 One thing to remember when making stamped backgrounds with several images- start with your largest images first! That way you always have room for them and you can squeeze the smaller images in wherever. 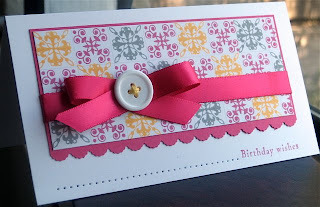 I tried this colour combo on white cardstock first. I loved how it turned out, but I wanted to try it on something besides white. I decided on kraft. I was delighted when the colours came out almost as vibrantly as they had on the white. I decided to use Natahsa's sketch to make a masculine birthday card. 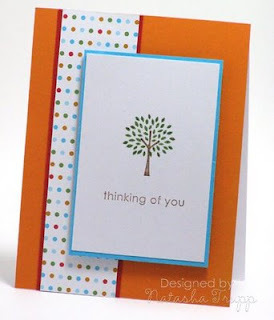 I used PaperTrey's Father Knows Best set and the sentiment is from PaperTrey's Around and About Sentiments. 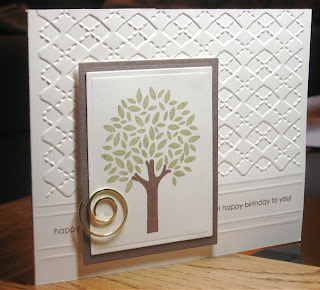 To keep it masculine looking, I embossed about 2/3rds of the Vintage Creme card front with the Argyle embossing folder . I then scored two lines right below the Argyle embossing and then stamped the sentiment and embossed another two lines below the sentiment. 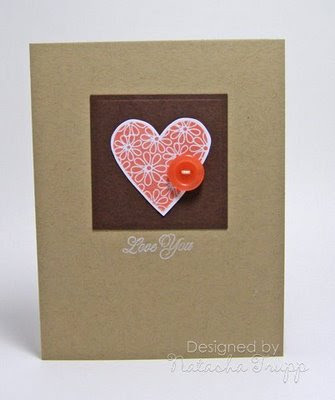 I would have liked to use a brown wooden button but I didn't have one so I went with the spiral clip instead. Supplies: Stamps - PaperTrey; Ink - Versamagic Chalk Inks; Paper - PaperTrey; Misc - Nestabilities, spiral clip, dimensionals, Cuttlebug embossing folder, Scor-pal. 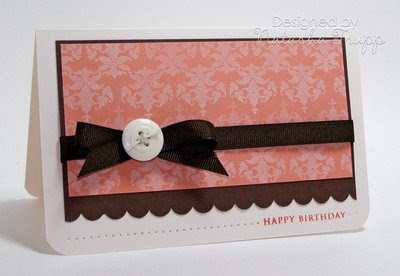 I can make cards in ten minutes when I have a great sketch to follow and any other guidelines or challenges. 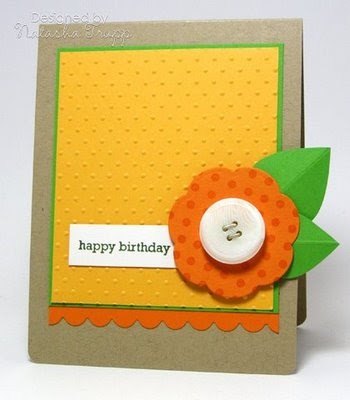 This card uses CPS113 sketch and it also uses Distressing which is the SCS CAS challenge. 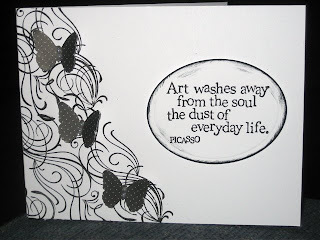 I used the direct to paper distressing around the edges of the sentiment. 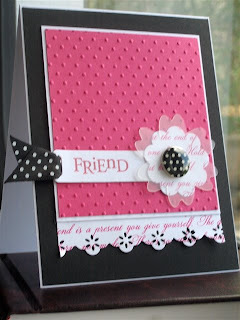 Supplies: Stamps - Inkadinkado; Ink - Versafine Onyz Black; Paper - PaperTrey Stamper Select, Making Memories patterned paper; Misc - Nestabilities, MS Butterfly Punch, pearls, Dimensionals, Glue Dots. I managed to get my hands on this fun October Afternoon stamp set, Detours. It has some really cute images in it. I had the chance on Saturday night to put together a little something with it. 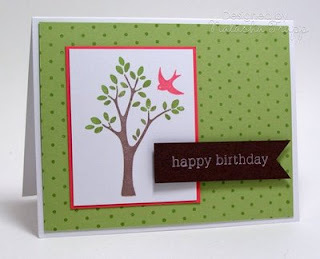 I inked up the tree with Memento tear drops, then decided that a Berry Sorbet bird would brighten up the card nicely. 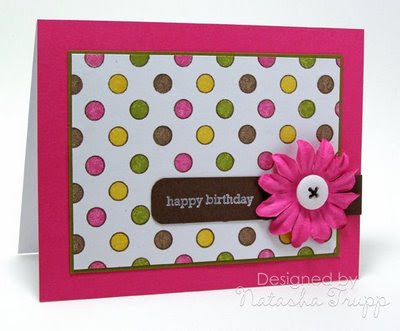 I added a thin Berry mat, a flag sentiment and polka dot background at the last touch and that was that! Another clean, quick and easy sketch! 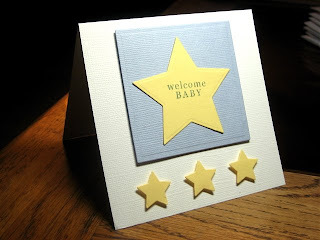 I picked out the patterned paper like Natasha did and then chose a 3D sticker that I have had forever. It feels so good to use up my stash of stuff! 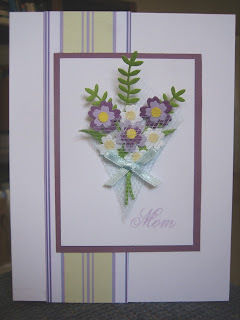 I made this into a Mothers Day card using "Mom" from PaperTrey's Women of Life set. 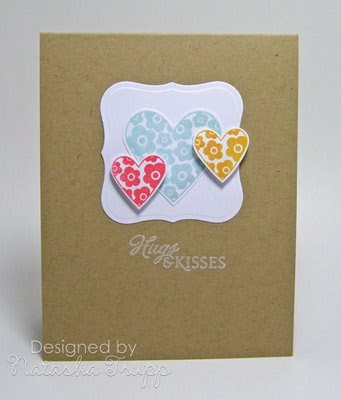 Supplies: Stamps - PaperTrey; Paper - PaperTrey Stampers Select, DCWV patterned paper; Ink - Versamagic; Misc- Sandylion 3D sticker. ETA: I guess it would be good to post the sketch!